Since the new IPPT format was unveiled more than a week ago, there have been a lot of discussion about the pros and cons of pulling out the chin-ups station and pushing in the push-ups station. Many seem okay with the jettisoning of the shuttle run and broad jump stations, but also feel that if you really want more NSmen to pass, then it's the 2.4km run that has to run away. But no one seems to have a problem with the sit-ups station which is the other station to survive the IPPT revamp. And it's not because I can't do sit-ups. It was the only IPPT station where I would always get the maximum points. Mindef has stated that sit-ups are "a test of abdominal strength and endurance". The problem is that sit-ups have long fell out of favour as an exercise to build abdominal strength. In fact, sit-ups are now considered bad for you. So what should you do if you want abs? No, not even crunches. The in thing now seems to be the plank. Planks recruit a better balance of muscles on the front, sides, and back of the body during exercise than sit-ups, which target just a few muscles. Remember, your core goes far beyond your abdominal muscles. And you know what else is also good for building abdominal muscles? So by adding the push-ups station to the IPPT, Mindef actually made the sit-ups station redundant. The problem is that the US test was introduced back in 1980. So to base our new IPPT format on the US test is like building a new computer in 2014 based on the Apple II. Floppy disk drives, anyone? Another problem is that fitness trends can be as fickle as fashion trends. 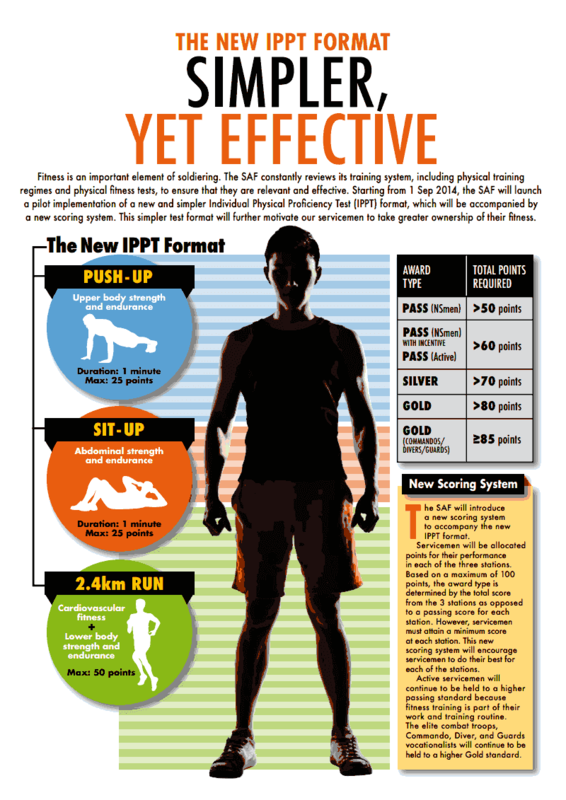 It took almost 30 years for Mindef to update the IPPT. I'm not sure they got it right. But, yes, I'll miss my old frenemy, the chin-up.